This post is a collaboration between Xin Tan, Lara Haase, and Jeff Reichman. On the surface, the hotel occupancy tax (HOT) is an unlikely hero in the battle over funding for the arts. But Houston devotes more HOT funding to the arts than any other city in Texas. Every time we rent a hotel room, 17% of the gross goes to the hotel occupancy tax. That money is collected and administered at the state level by AirBnB, and at the local level by Houston First. Ultimately, some of the local dollars are distributed to groups like the Houston Arts Alliance, the Miller Outdoor Theater, and the Mayor’s Office of Cultural Affairs, among others. These organizations are responsible for some of Houston’s best known public art programs, including the Houston Urban Experience Mural Festival and the programming at the Miller Outdoor Theatre. Their programs also support local artists through grants and professional development. In other words, the hotel occupancy tax is very much a central figure in any discussion of public funding of the arts. This blog explores the impact of AirBnB on HOT revenue. What is the HOT and how does it break down? While AirBnB automatically collects HOT for the State of Texas, they leave the burden on the host to collect the remaining balance from their guests in person, or through AirBnB’s “Resolution Center” after check-in. Either way, it’s probably pretty awkward. In order to remit the remainder of the HOT, AirBnB hosts in Houston are supposed to register as a hotel in both the city and county. However, according to Houston First, only 174 people have identified themselves as a “short term rental.” There might be more AirBnB hosts registered, but they don’t ask if you’re running an AirBnB on the registration form. Maybe they should. 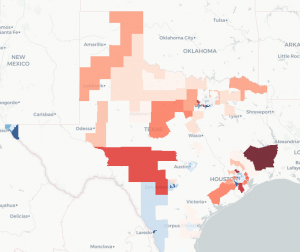 In our analysis, we identified 6,132 AirBnB listings in Houston. Of those listings, 3,176 had at least one review. Reviews are a good proxy for activity: in order to have a review, a guest must have booked a room. This eliminates a lot of the “super bowl” listings with astronomical daily rates. What’s left are thousands of active AirBnB hosts, yet only 174 have registered to pay the HOT tax. If the problem is finding and registering hosts, AirBnB has been down this road before. In late 2016, they unveiled a partnership with the City of New Orleans, where AirBnB and the city worked together to develop policy and share data about hosts, leading to more local registrations and better compliance with tax payments. The company also automatically collects the tax from guests and remits it to the city in Portland, San Francisco, and Amsterdam. But Houston does not get this kind of assistance. Instead, we must assume that almost all of the local HOT portion goes uncollected. What if we could collect the tax left on the table? Since a significant portion of these funds go directly to the arts, we wanted to know the effect of HOT non-compliance on available arts funding. What if all AirBnB hosts paid the full 17% HOT? What would that mean for arts funding in Houston? We ran the numbers to find out. Over the last year, the Houston arts community missed $332,766 in uncollected HOT revenue from AirBnB hosts. This is an average of $27,730 per month. 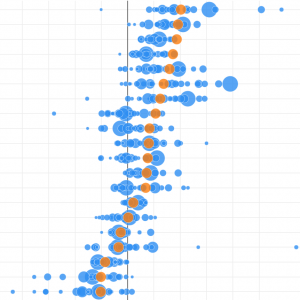 From there, we used total taxable room receipts as a baseline. These are the gross receipts declared by AirBnB and paid on behalf of hosts within the boundaries of the City of Houston. Then we multiplied the total taxable room receipts by 1.23% to calculate the share for Houston arts organizations, and by 0.12% to calculate the share for the Mayor’s Office of Cultural Affairs. 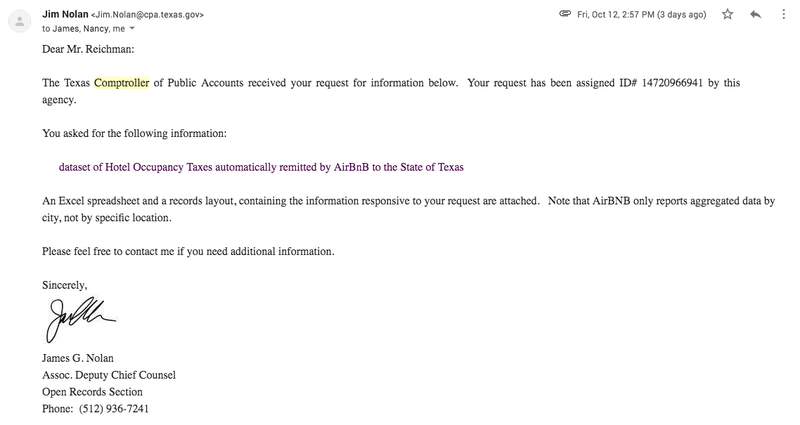 Write to AirBnB and ask them to automatically pay the local portion of HOT to Houston First. If they can’t do that, ask them to work with Houston First and the City of Houston to register hosts. Write to Houston First and ask them to add a question to the registration form that helps disclose whether the hotel is an AirBnB. Write to arts organizations that benefit from HOT to work with the city to explore better ways to collect these funds. In a world where arts advocates have to fight for every bit of funding available, this seems like an unusual opportunity for arts organizations to simply collect what they deserve.